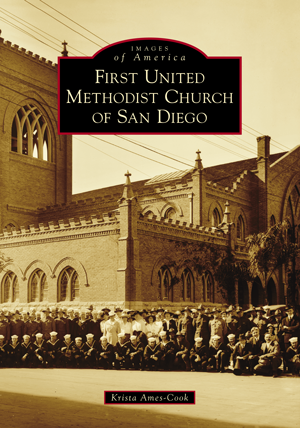 First United Methodist Church (UMC) of San Diego has worshipped in several locations throughout San Diego, California, since February 1869. As the city of San Diego grew, so did the church. The first locations were near the waterfront and in the neighborhood that is known today as the Gaslamp Quarter. From 1870 to 1906, the church was in the heart of what is now downtown. In 1906, the congregation decided to move a few blocks northeast, and it worshipped from 1907 to 1963 in a Gothic Revival–style sanctuary designed by Irving J. Gill. In the late 1950s, even with additions, First Church was outgrowing its space, and so it moved again, to a location in Mission Valley. In 1963, construction began on a Spanish contemporary–style church that was completed in 1964 and continues to be an iconic landmark in San Diego. Over the years, the church's reach has expanded to multiple sites and many congregations. Author Krista Ames-Cook, an educator with an interest in vintage photographs and local history, volunteers her time to serve as the First UMC of San Diego church historian and is a lifelong United Methodist. Images of America: First United Methodist Church of San Diego draws on photographs and research from First Church and local community archives.